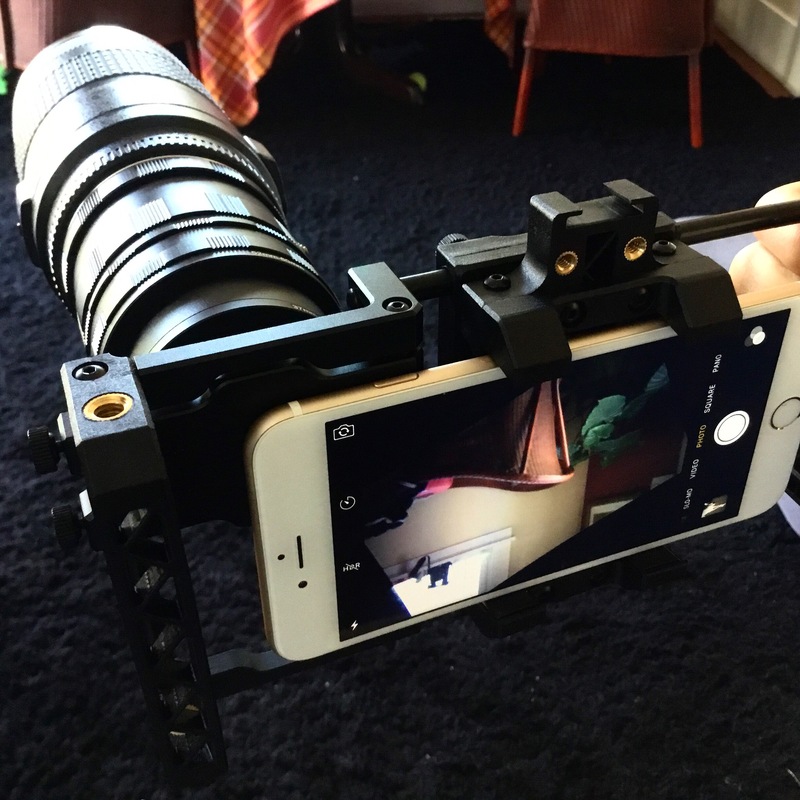 Today’s topic, a very quick overview of Beast grip pro universal phone cage/DOF lens mount/accessory attachment device. Why on earth, with all the beautiful camera systems that I already own, would I get something to make my iPhone shoot more like a useful video camera you ask? Here is my logic. A lot of times I’m out and about, and I see something I’d love to shoot, maybe walking the dog, or before a dive… Now as much as I’d love to have my big camera there, or even one of the smaller ones, that is just illogical. I have found out the hard way that I am just never going to lug those systems around as much as I’d like or leave them in the car to be theived whilst I explore the underwater world. What recorder and sensor with a little eye do I have with me all the time? What little camera do I whip out when I see a humming bird or funny dog at the drop of a hat only to bemoan it’s lack of good glass and ability to be creative with things like DOF. You guessed it, my iPhone. There are a ton of clip on screw on snap on lenses for the iPhone, and I’ve heard fantastic things about at least half of them. The beautiful crispy images out of the Moment lenses is for sure beguiling. But we are still dealing with the issue of handheld camera. Even with the stabilization of the iPhone 6 Plus things can still be a bit motion sickness inducing. With the addition of the 4K option in the 6 Plus S, and ability to utilize the lightening port as an HDMI out to off board recorder, for ‘made for YouTube’ videos, the iPhone really is a great tool. Simple editing tools in your iPhone/iPad round things out for creating content if you are even the slightest bit inclined. That is not to say it isn’t without some conflagrations. Set up itself is quite easy, the directions are clear, but then you need to decide what app you want to use for controlling things like white balance, ISO, etc. If you have a bigger phone you’ll want to add on the short extensions so the home button is readily reachable. The use of the Canon glass is simply that, you are using the glass. There is no electronic control, no auto focus no auto anything with the lens. Utilizing a DOF (Depth of Field) adaptor means your image is flipped (upside down and backwards) so you need to choose an app that has DOF adaptor setting, otherwise you will be getting good at being a dentist or laparoscopic surgeon in a hurry (all your movements are opposite what you see on the lens). I’m still testing out 4 or 5 different options, and will hopefully settle on one of them soon. Moviepro and Cinecam are neck and neck right now although neither are without their shortcomings. I will write more about that as I get more comfortable with the assorted apps. More (better) examples of #iphoneography can be see in the film “Tangerine” (shot entirely on iPhone) and the music video for Edward Sharpe directed by Olivia Wilde which utilizes the Beastgrip system. ← My Dad and Pokemon Go!